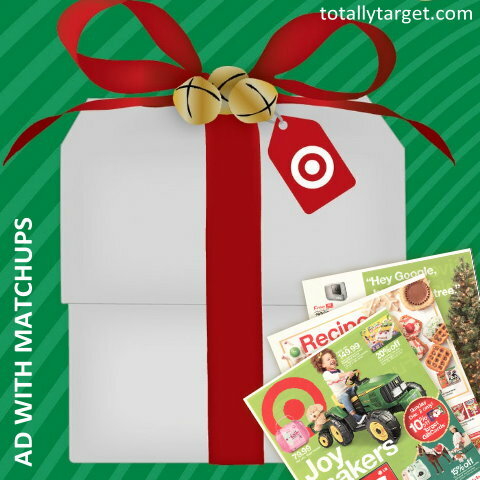 Here is the Target Ad for 12/2 – 12/8 with coupon matchups. (Go HERE to see the full ad scan and you can check out my Best deals of the Week post HERE). I will add any more matchups to this post as I find them and if you can think of a mainstream coupon I’ve missed please let me know in the comments. On Sunday, December 2nd only, Target will be offering up 10% off all Target GiftCards both in store and online at Target.com. You will need to purchase a minimum of a $10 Target gift card and there is a maximum of up to $300 worth of Gift Cards per household for a maximum discount of $30. NOTE – any Gift Cards purchased during this offer period cannot be used as payment until Monday, December 3rd at 10 am Central time. And Gift Cards purchased online must be done in one transaction. THE FINE PRINT: Offer does not include Target Visa, American Express & MasterCard Gift Cards and gift cards issued by other retailers, reloads of previously purchased gift cards, Target gift cards given in exchange for electronic or prepaid trade-ins, Target giftcards provided for merchandise returns or promotional gift card with qualifying purchase. Purchases that exceed the set limit for this discount will be voided. This week Target is offering up a FREE $5 Gift Card wyb 4 select Hair or Personal Care Products priced at $3.99 or higher. No coupon is needed, and the offer includes shaving, body wash, hair care, oral care & deodorant. It does exclude hair appliances, hair color & accessories, power shave, power dental, liquid hand soap & sanitizer, Harry’s and travel size toiletries. Here’s a roundup of some printable coupons that you might want to print & hold for next week….